“Spring is almost here, and that means LifeLine Animal Project will soon be bursting at the seams at our county shelters as we take in between 40 and 70 animals every day”, Karen Hirsh, LifeLine’s Public Relations Director, told us. She further explained that all the new puppies and kittens that are being born will need space to grow, and sadly this is one area where we are limited. ATLANTA, GA — (March 3, 2017) Springtime in Atlanta brings the sunshine, Dogwood blooms and, sadly, skyrocketing intake levels at DeKalb County Animal Services (DCAS) and Fulton County Animal Services (FCAS) due to the high number of animals being born. To encourage the public to adopt, LifeLine Animal Project is offering $40 adoptions on all dogs weighing over 25 lbs. and all cats throughout March and April. All of LifeLine’s shelters are participating in the promotion, including; Fulton County Animal Services (FCAS), DeKalb County Animal Services (DCAS), LifeLine’s Dog House & Kitty Motel and LifeLine’s Cat Adoption Center. The adoption includes the pet’s spay/neuter, microchip and vaccines – a $250 value at no cost. To view animals available for adoption, for adoption rates, or for the shelters’ addresses and phone numbers, please visit www.dekalbanimalservices.com, www.fultonanimalservices.com or www.lifelineanimal.org. Together, we can make Atlanta a no-kill community! A nonprofit founded in 2002, LifeLine Animal Project provides lifesaving solutions to end the euthanasia of healthy and treatable animals in county shelters. LifeLine manages DeKalb and Fulton County Animal Services, as well as a private rehabilitative shelter and two LifeLine Spay & Neuter Clinics. LifeLine cares for over 27,000 animals annually and has performed over 100,000 free and low-cost spay/neuter surgeries to date, including 30,000 stray/feral cats through Catlanta, metro Atlanta’s first and largest trap-neuter-return program. 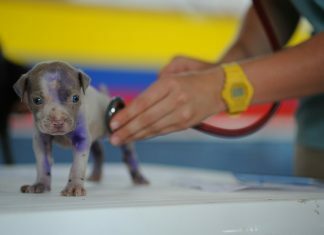 Outreach programs focus on improving the standard of care for animals in the community and preventing pet overpopulation. For more information, please visit LifeLineAnimal.org or follow us on Facebook and Twitter.